Krizta Moon is a dynamic performer, songwriter and board certified music therapist who’s traveled thousands of miles and played for hundreds of listeners. Her voice can be described as sultry sweet with a dreamy grit. Her music is deeply revealing and elicits devious charm. She is currently recording a new EP titled “Tending the Garden of Truth”. For more information, go to her website at www.kriztamoon.com or visit her on Facebook at Krizta Moon and Krizta Moon Music. Jeff Howard is the founding guitarist of the CT jam band trio THE MCLOVINS and was a regular guest guitarist for the national band BAREFOOT TRUTH. Jeff has headlined at Infinity Hall, The Kate, Fairfield Theater Company ,The Calvin theater as well as The Gathering of the Vibes over the last four years. He released three CDs with the McLovins and played guitar on Will Evans’ “Wishin Well” CD which went to #4 on Billboards Heat Seekers chart. Jeff is presently a student at the University of Rochester and Eastman School of Music. 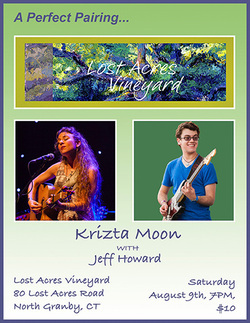 Jeff and Krizta have known each other for many years and are looking forward to their debut at Lost Acres vineyard.